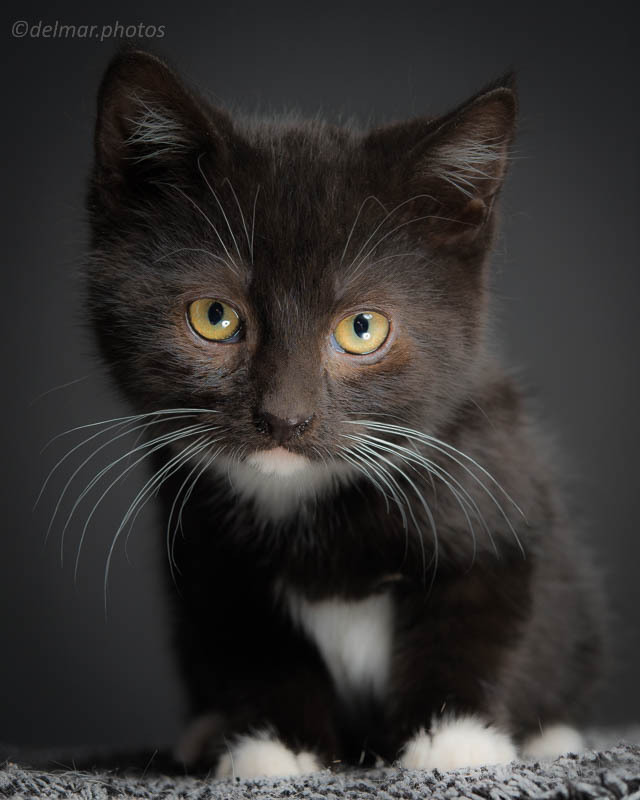 This page is for anyone who wants to volunteer their photography skills at their local animal shelter, and wishes to produce exceptional images. You’ll find info on a few good techniques for getting shots that will make people notice your subjects--the animals that need homes. You’ll be doing good work, and you’re certain to make new friends--both of the two-leg and four-leg variety. 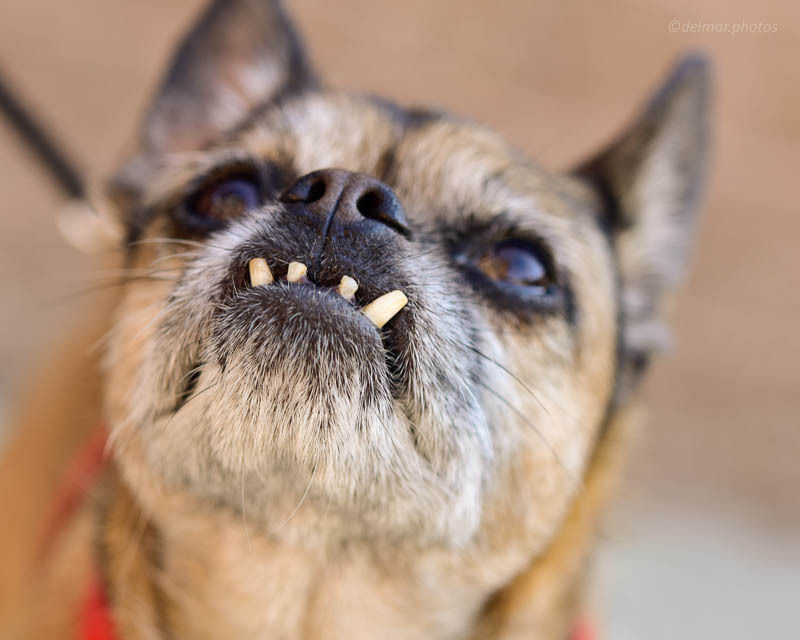 Why: There’s lots of shelter animals out there, more than can be found homes for. Good images get people’s attention. That’s your pay-off. You’re making a compelling argument that this cat or dog is the one that someone wants. It’s kind of magical, and it works. You want these animals to look deserving of a professional portrait, so give them one. Who should be reading this: Ideally, you’re the owner of a DSLR or comparable mirrorless camera. If you have some understanding of photo lighting gear and photo editing, you’ll feel comfortable. 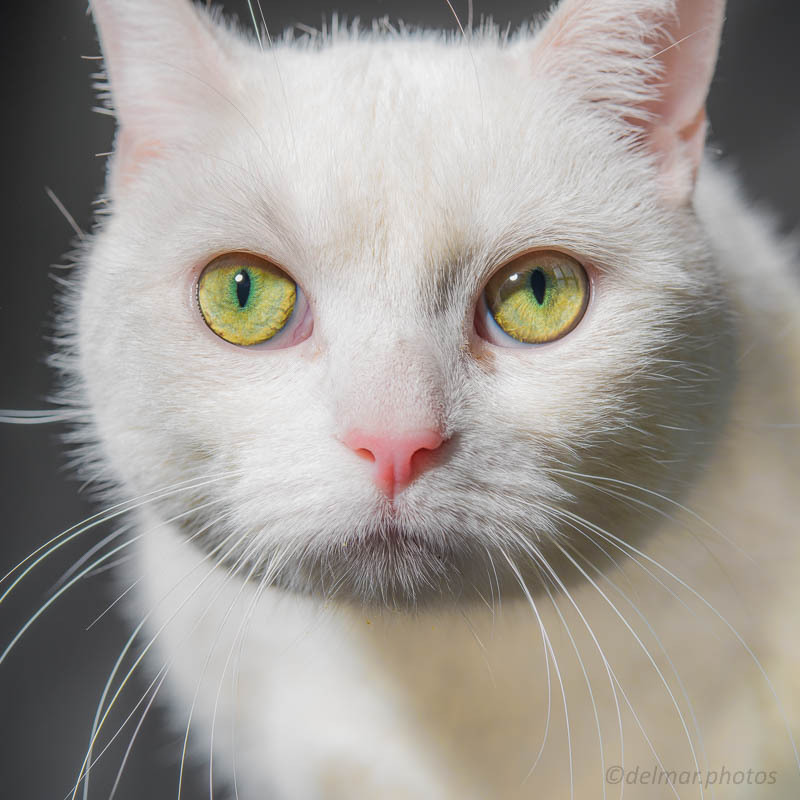 My experience: I’ve been an active volunteer photographer for my local shelter for a few years, always trying to up my game, so I’ve tried several different techniques. I’ll explain why I do things the way I do. The very first tip, the very most important tip: Shoot at eye level. That simple consideration will make every picture better. All work I do is done within the shelter. No outside stuff. Outside is weather-dependent, and isn’t suitable for cats. Inside knows no season, and allows your images to have a consistent, signature look. Shelter “studios” aren’t, um, glamorous. But it doesn’t matter. Here’s a setup for dogs. Single, studio strobe “monolight” with 22-inch beauty dish and sock. Background is dirt-cheap and frankly, is really all you need, as explained in the text. For cats, I do a lot of tabletop. Still fancy. Shiny metal desktop creates fantastic fill. Some cats aren’t thrilled with the cold table, so we always have covers to put on top for cozy. Monolight: You gotta bring light to the game. Not an on-camera flash--their shadows are bad, are awkward to work with off-camera, and simply aren’t up to the challenge. You need a more powerful light source than that provided by any shoe-mount flash, and you need to soften the light to make is less shadowy and more flattering to the subject. For simplicity’s sake, I use a single “monolight,” a term that describes a more powerful flash than what a shoe-mount flash provides. They can be AC-powered, as mine is, but many come with rechargeable lithium batteries now. You’ll also need a lightstand and a modifier (like an umbrella or softbox or beauty dish) to soften the light. A minimum of 400 WS (watt-seconds) of power. Likely, you won’t be running the light at full power, but you need the reserve power for faster shooting (bursts of two or more a second); animals’ expressions are fleeting, and you don’t want to miss an opportunity waiting for a weaker flash to recycle. Simply, a powerful flash is ready quicker for the next shot. Not every subject is going to be relaxed. Pop off a few shots to get animal more comfortable—or at least become used to what the heck is going on. Besides, you may get a keeper. Heavy vignette here to add to the drama. B&W because sometimes, color distracts. We have a much more relaxed shot that was used for PetFinder, but wasn’t about to delete this one. Remote-trigger: You don’t want to run a wire to your monolight--too easy to trip on with dogs or cats running about. Remote triggers (radio-triggered) of good quality can be purchased for $100 to $200. Google is your friend. Light modifier: I use a beauty dish. It’s 22-inches diameter. A little awkward to carry around, but it fits in tight places. You’ll be very lucky if tight spaces aren’t a consideration. Cost: from about $50 and up. I also use a “sock” on the dish to further soften the light (a “sock” here is an elastic-bordered circle of nylon that diffuses the light from the monolight’s beauty dish). Scroll up to see use of a beauty dish for cat and dog photos. Another way you can go is to use a photographer’s umbrella. However, they’re less efficient, are larger than a beauty dish, and break easily. Also, I’ve found umbrellas can spook animals. Extension Cord: Unless you’ve spent extra for a pricey battery pack, you’re plugging your light in. Spend a few bucks on a quality, 15-ft grounded extension, and throw it in your bag. Now you can pick the spot that works best. Important thing about backgrounds: Keep them a significant distance from your subject, like 6 feet. Otherwise, your monolight will be throwing too much light into the back, lighting up your background in ways you probably won’t like. Camera: This is secondary to your lighting. Really. With good light, any DSLR camera bought in the last 10 years will look good. However, a higher MP camera will help your assignment tremendously. See Composition for reasoning. Lens: I do 95% of my work with a non-zoom lens. I favor a 60mm macro (Nikon 60mm f2.8 AF-S). It’s quick focusing, works at any distance from inches to whatever, and is compact and very sharp. See the Composition section the learn how one lens can work for animals, big and small, near and far. I also bring a wider lens (35mm f1.4) for the occasionally necessary cage shots with limited light, and fun, available light work. Gorgeous cat that needed a ton of cleanup. Coat was full of dander, eyes needed some cleaning, but the results are kind of dreamy. Natural light shot of a peaceful, content shelter cat. Composition: Here’s why I get away with a 60mm, and why: I crop like crazy (psssst: this is the big secret). People want to see the animals’ faces, and keep in mind that Petfinder and other sites first show small thumbnails, so the subject impression in your thumbnail matters. In fact, the thumbnail is likely more important than how perfect the shot looks when clicked. If the viewer never gets beyond the thumbnail, they’re not looking for that animal at your shelter. Any space in your image that shows anything but that cute animal’s face is a waste of pixels, and isn’t helping the animal’s case. The only background you need “clean” is the area bordering the subject’s head. So here’s what I do: I stay back, maybe 5 to 8 feet for dogs, and maybe half that for cats. I wait for the cat or dog to be looking at the camera, and shoot a few in quick succession. You want eye contact with your subject, since that will engage the viewer on pet websites. Grab any good shot you can get, because that marginal shot may be the best shot you can get. Don’t wait for better if what’s happening right now is pretty good. Ready for over the fireplace. This is Sophie, BTW. Wrangler: You need someone to handle the animals. For dogs, I usually put some gaffer’s tape on the floor to mark a necessary distance to the background and request that the handler keep the subject centered. Most wranglers won’t naturally think positioning from the photographer’s perspective. But they’ll pick it up when they see how you shoot. Be prepared for the moment the animal looks right. This isn’t a time to test exposure, so always test your setup before the first subject is brought over to the shooting area.. Regarding handlers, you’ll get to know a few people at the shelter that are really good, and they’re worth gold during your picture shoots. Thank them. 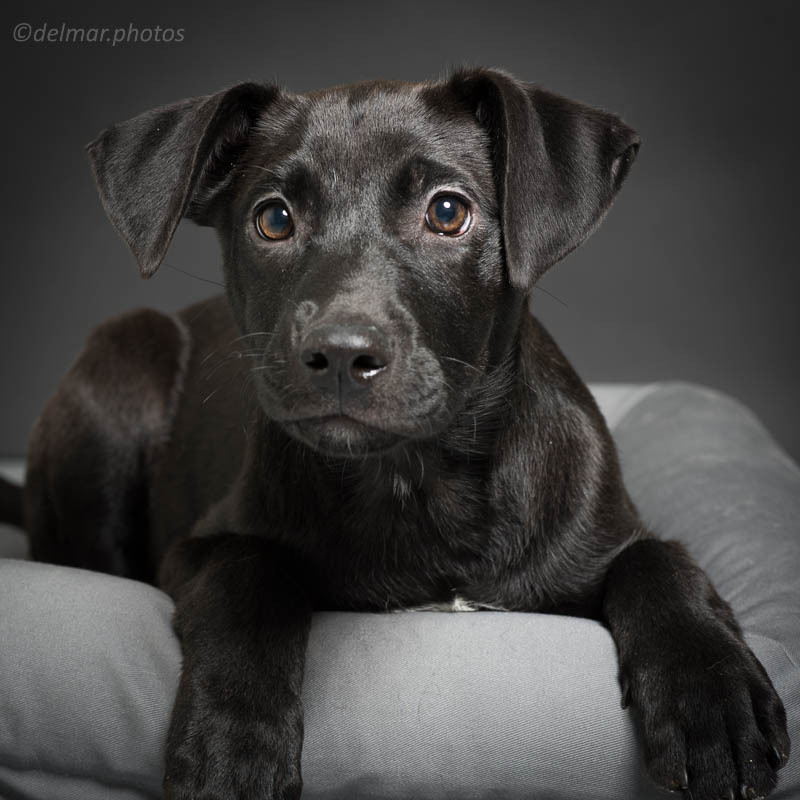 After every shoot, and give them full credit when you send the images to the shelter. They deserve every praise you offer, because their skill in guiding the animal (while keeping the subject calm) allows you to get those great images in the first place. Wranglers may need to use a leash to contain jumpy dogs. Leashes are pretty easy to remove in post, but only when the leash is pretty relaxed. A leash in the shot won’t kill the pic, but it will be a distraction, so it’s worth the time to clone out. Wranglers make the world go round. Dogs: high-pitched squeak toy you can put under your foot to get their attention while you shoot. You’re a one-man band. Cats: Good luck. Cats shun human demands. They’ll look when they feel like it. So time accordingly. Above all, be relaxed. Talk quietly and provide a nice vibe. Eventually they’ll reward you with a gaze. Work it. The following assumes a working knowledge of photo editing software. I use Adobe Lightroom for 95% of my work, and Photoshop for the rest (primarily for major cloning and filling in backgrounds). Selecting your pic(s): You only need one or two good pictures. Don’t send the shelter a dozen pics. They won’t be able to use them all, and they may choose the shot that you don’t like the best. Only send your best work. They’ll think you’re a genius. Major crop. Eye junk cleaned up. Eyes brightened. Added exposure to face. Added vignette. Done, and total edit time: less than 10 minutes. Crop: I usually crop to square (but not here on this older shot), since it works well with faces, works well with Instagram, thumbnails, and doesn’t tend to get scaled weirdly for media submissions. I crop first, and then do all the other stuff. You may be cropping to a small fraction of your original image, but remember: It’s the face that counts. Crop to that beautiful face. You’re probably shooting with a 12 mp camera or better. You have plenty of room to crop. (More info on image size in section Export). I’ll fix the visible sleeve on left in post, along with a few other, quick changes. Shifted the background color in post to make this pretty dog’s brown fur pop. Brightened up both eyes, as well as the the face on the left side of the image. Really, very little needed to be done here. White Balance: Set, based on a neutral-toned wall or anything lit by the same light as your lighting. If you’re a jpg shooter (as opposed to shooting raw), you want this variable set before you shoot. Raw gives you much greater flexibility for WB after the shoot. Clone out: Get the gross stuff out of the way: Clone out that eye crud. Then clean up the loose hairs, vanish the leash. Eyes, again: While you’re focused on the eyes, how about lightening them up and giving a touch of saturation? The eyes are everything (“windows to the soul”). So have clean, bright windows. Do you have a catchlight in one eye, but not the other? Clone in the second catchlight. It’s subtle, but makes the shot better. I promise. Local lighting adjustments: Face exposure should be perfect. Make it so. Then throw the background a bit darker, but go subtle, since heavy-handed looks cheap. Background: Take a moment and look at the background. Is it clean, and without any distractions? Good. Otherwise, clone out that electrical outlet and the crack in the wall, or the mark on your seamless. Remember: You want these animals to look deserving of a professional portrait, so give them one. Vignette: Go easy here. Our eyes are drawn to light (thank you, moth DNA). A subtle vignette leads the viewer’s eye to your subject. But remember: Subtle, so if it looks like a porthole, you’ve overshot your slider. Slide it back. Tip: Look at your pic in a very small view on your monitor. Does the vignette look overdone? If so, the small view of the image always shows that fault. Getting the light off the camera and close and large on the subject makes this look possible. Just a crop, a little WB adjustment and brightening of the eyes, and this shot was done. Everyone has a different workflow, so what I describe here is easily done in Lightroom and meets the needs of my local shelter. I rename every keeper shot of each subject with the pet’s name, along with the exported size. Easier for everyone. export for print (minimum of 1500 pixels on either dimension), larger if making enlargements for the shelter (hey, that’s a great idea! They’d love that!!). Zip up all your web size in one file (name it something helpful for you and them, like “20181028_web_shelter”), and zip up all the larger, for print, and name accordingly. Be sure to export as sRGB color space (not Adobe RGB or any other choice) Doing so will keep your pictures very close to what you see on every browser, and it’s good for print places, too. Some more favorite pictures down below. Some are fun shots of shelter life. Take every opportunity to show that. There’s tons more detail I could provide on this Shelter Pics How-to, so ask questions in Comments link at bottom. Thanks for reading this, and hope it helps you get the shelter shots you want. All images copyright Eric Delmar.